Does this plant look familiar? 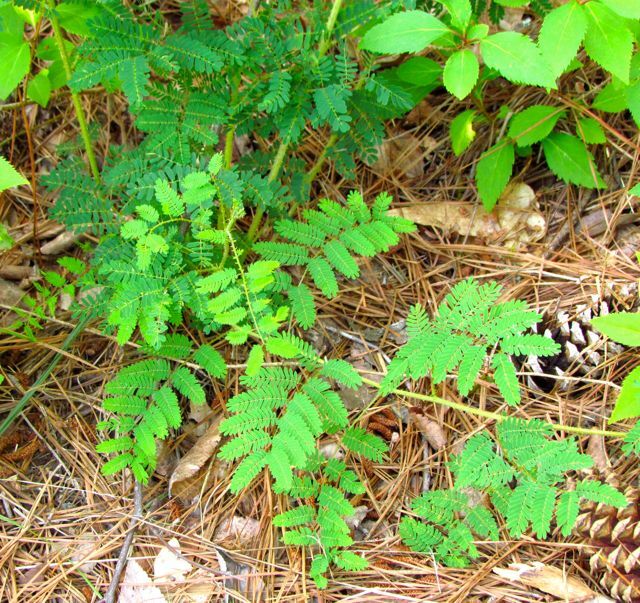 If you turned it into a tree and made the leaves and flowers larger, it would look a lot like a non-native, invasive tree common to many southeastern Piedmont landscapes: Albizzia julibrissin, commonly called Mimosa Tree. But this is not a young Mimosa Tree. This is an inconspicuous native vine of our region. 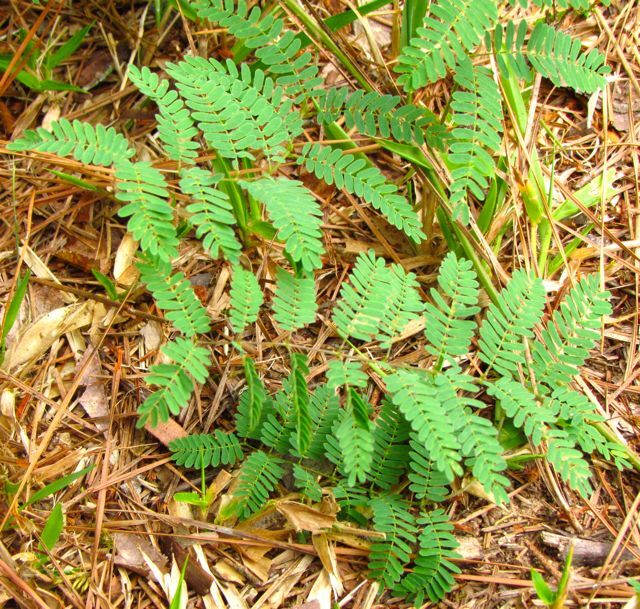 Like the Mimosa Tree, the Eastern Sensitive-Briar (Mimosa microphylla) is in the Legume family, which likely explains the resemblance. I learned about this vine when I became a tour guide at the NC Botanical Garden in Chapel Hill, NC. It grows in the Sandhills Habitat Garden, where this vine covered in tiny (not really pain-inducing) prickles sprawls over other plants in the exhibit during the growing season. It is easiest to spot this time of year when it is covered in pink flower clusters shaped like globes. Because I learned of the plant in that exhibit, I thought it was a native characteristic of the Sandhills geographic region, and it is. But this delicate deciduous vine is more widespread than I realized, thriving in dry woodlands and forests and in disturbed areas throughout much of the Carolinas and Georgia. I discovered it growing in my yard last year right where my research told me to expect it: along the disturbed edge of my woods beside my road. The mixed mess of vegetation growing along my roadway is an area I have largely ignored over the years. Its purpose is to create a barrier between the road and the rest of my yard, and it fulfills its function admirably. So I was pleasantly surprised last year as I was mowing the strip of grass along the road to spot this vine sprawling on nearly barren ground at the edge of the woods. This year, it has spread a bit, but it is not invasive, and it’s a great novelty plant, so I’m letting it sprawl where it will. Note the compound, evenly bipinnate, mostly alternate leaves. And why, you ask, do I think of it as a novelty plant? 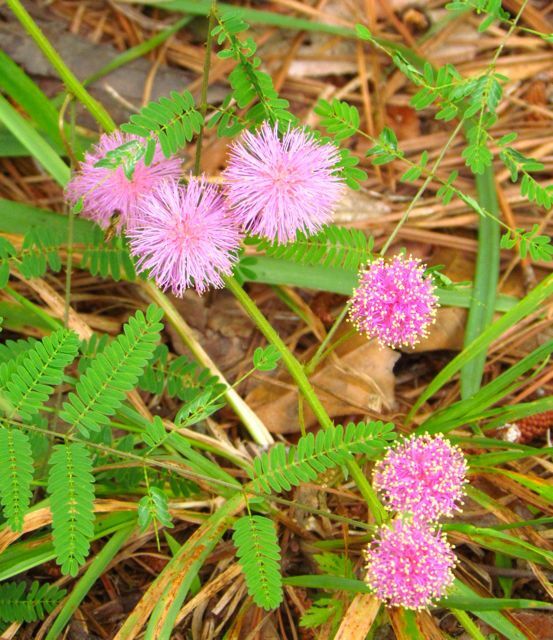 The answer to that lies in its common name — Eastern Sensitive-Briar. This refers to the touch-sensitive nature of its leaflets. 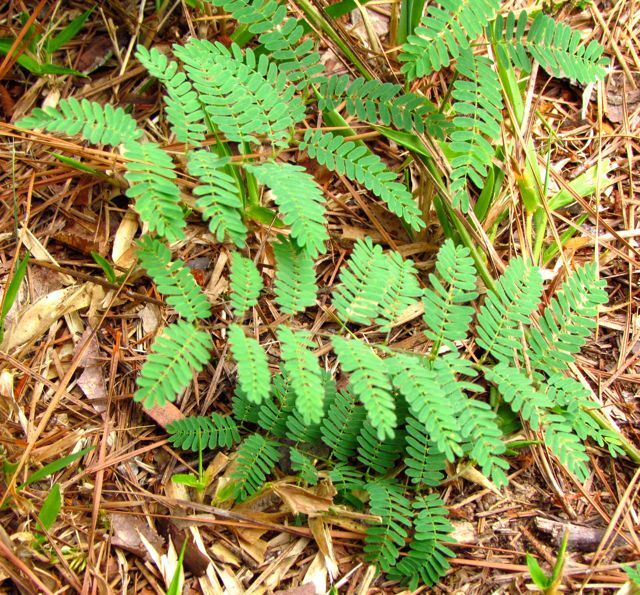 Have you ever noticed how the leaflets on Mimosa Trees fold up at night? If not, check it out sometime. Note the open leaflets along the section in the middle. You may need to click on the above photo to enlarge it for a better look. Personally, I think this is a nifty feature, and I know whenever I volunteered as a tour guide at the NC Botanical Garden and demonstrated this trait, it elicited astonishment from visitors. It would have never occurred to me to deliberately plant this little native vine in my yard, but since it found its way on its own, it is welcome to stay. The diminutive pink powder puff flowers are lovely, and the child in me will never grow tired of tweaking a few leaflets to make them close. This entry was posted on June 21, 2012, 3:27 pm and is filed under Favorite Plants, piedmont gardening. You can follow any responses to this entry through RSS 2.0. You can skip to the end and leave a response. Pinging is currently not allowed. A quick search of my usual sources revealed absolutely no indication that Eastern Sensitive-Briar is poisonous. It does have tiny thorns, so you don’t want to squeeze the stems with bare hands, but I don’t think it is poisonous. I know I have fondled the leaves many times (to make them close) without ill effects. Thanks for stopping by!